The Daniel’s escapement has been under development for over 20 years by Dr.
the reliability and accuracy of mechanical watches. 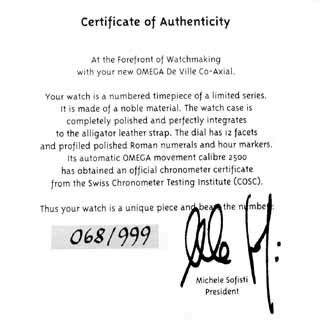 That Omega, the most recognized brand of the SMH group after Swatch, worked to bring this to market first yields some clue as to the potential importance of this development. One could argue that only SMH had pockets deep enough to move forward with the tooling for the Co-Axial escapement; however, the fact that this tooling has been developed means that we can look forward to regular use of this escapement as SMH recovers the development costs. An interview with Jean-Claude Biver of SMH indicates that the Co-Axial escapement will be showing up in several other brands in the near future. This was one watch which I kind of fell into. I told myself some time ago that while I would never actively seek one of these timepieces, if I saw one unspoken for in a shop, I would buy it. That day came in November of 1999 in downtown Seattle. They even had my choice of white dial and blue dial. too many dark faced watches. Nevertheless, the blue dial version is stunning in person as well. DeVille line. 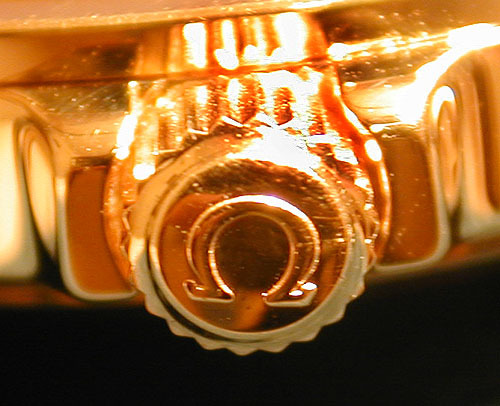 Rather, it recalls the look of the famous Omega Constellations of the 1950’s. The pie-pan dial, the large applied markers, and the shaped lugs all were characteristics shared by the Constellation of yesteryear. The overall image and heft of the watch is that it is a substantial piece. With a basic case diameter of 38mm (not including the crown, crown protectors, and lugs), the watch itself is sized fairly normal by today’s standards, but lugs and crown protectors add a lot of bulk to the appearance of the watch. Furthermore, this watch is somewhat thicker than usual for a simple calendar with a movement height of 4.05mm: the watch itself measures 9mm (in comparison, it is about 12% thicker than the regular Omega DeVille automatic using a similar movement). These dimensions yield a total watch weight of about 80g including clasp and strap. stunning piece, with a high polish everywhere. All of the elements of the dial, case, crown, and strap are complementary and in balance. As the first gold dress watch of my collection, I’m happy to say that it would fill in that role handily even without the Co-Axial escapement. 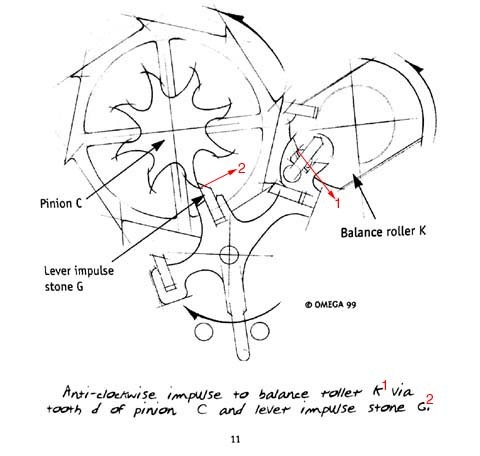 locking and force transfer functions of the escapement among four jewels. 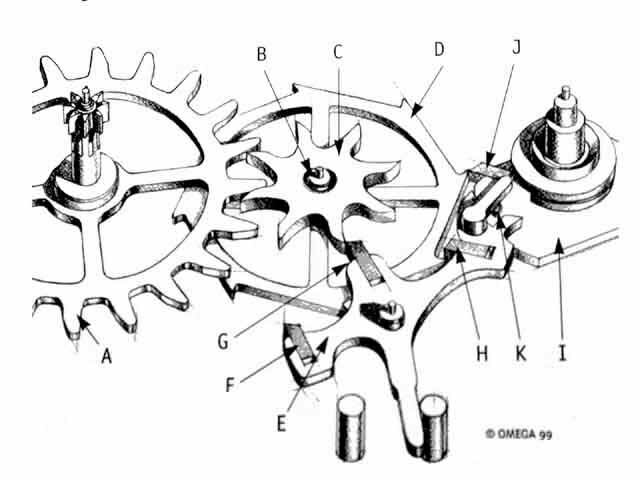 In the photo above (from the Omega literature), Wheel (A) is a modified Fourth Wheel of the wheel train, and provides the torque to the escapement. 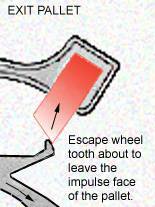 (C) & (D) is the “Co-Axial Wheel”, which functions as the escape wheel. The two wheels (C) and (D) are rigidly mounted together, on the same axis (B) – hence the name “Co-Axial”. (F) and (H), and impulse (force transmission) jewel G. Note that (G) is on a different plane compared with (F) and (H), so as to engage the upper set of teeth on the Co-Axial wheel. The balance (I) is only slightly modified in this arrangement. It retains the balance pin (K), but adds an additional jewel (J) to directly receive the force from the lower set of teeth on the Co-Axial wheel. Note that there is still a guard pin and safety roller built into this movement – these functions identically as in the traditional lever escapement. Since there is much less sliding going on during the force transfer, there is a reduced dependence on the quality of lubrication on the force transmitting surfaces of the escapement. This (in theory) leads to extended service intervals without adverse effect on the amplitude of the balance. 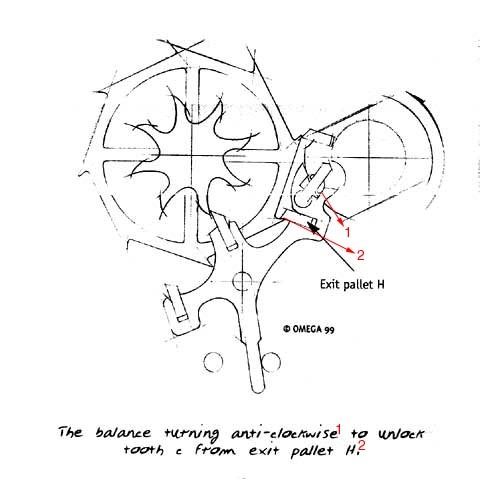 Once the lever has been unlocked, the extra jewel on the balance itself (J) is now in position to take an impulse from the lower teeth of the Co-Axial wheel directly (marked in red). (NOTE the caption is incorrect – the balance pin (a.k.a. balance roller) does NOT receive any impulse.) This will provide energy to the balance to keep the amplitude high, and simultaneously will also rotate the lever through to the locked position via the action of the balance pin. Impulse jewel (G) is now in a position to receive an impulse from the upper Co-Axial wheel (marked 2 to be consistent with the caption). This force is transmitted through the lever to the balance pin in the fork of the lever (marked 1 to be consistent with the caption), which will keep the balance moving. The lever will also be pulled through so that the escapement is locked once again after the balance pin leaves the lever fork. Note the counter clockwise escapement action differs from the clockwise escapement action: here the impulse is transmitted indirectly via the lever. 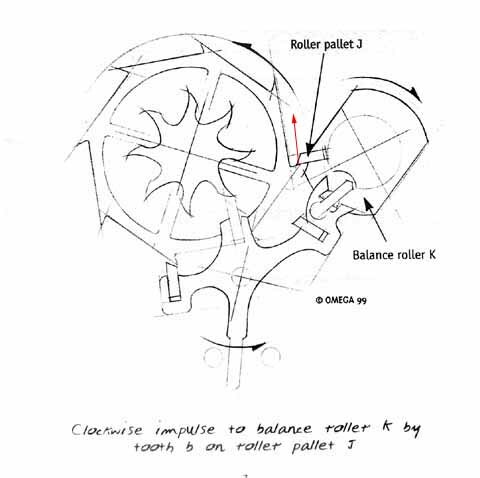 In the clockwise case, the balance receives the impulse directly from the Co-Axial wheel. However, due to the design of the lever assembly, the force transmitted in either case is similar. 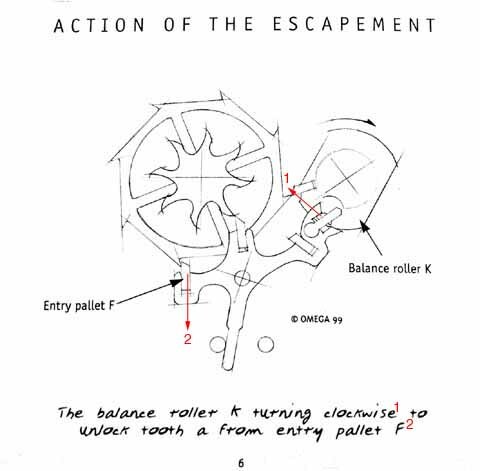 Finally, for more information regarding the Daniels escapement, with photos from some of George Daniel’s handmade prototypes, I’ll point you toward Gerry Luppino’s TZ Classic on the subject. 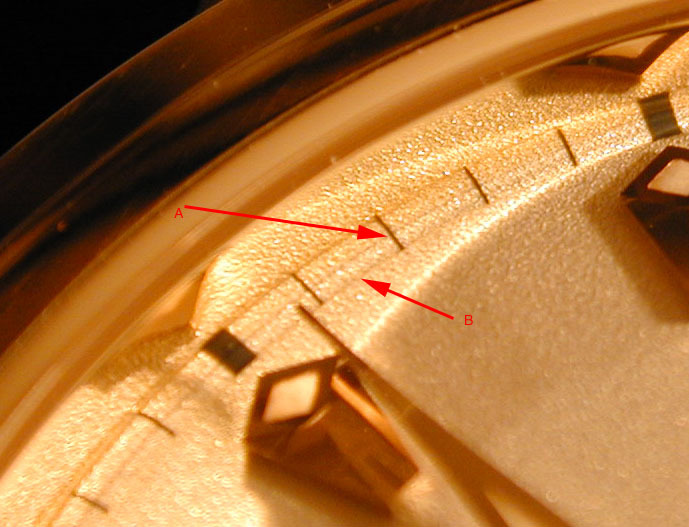 To control the rate of the watch, two microscrews are embedded into the rim of the balance. These are adjusted as a pair using a special tool calibrated to give precise advancement or retardation of rate. ratios to accomodate the new escapement. Since acquisition in November, the daily rate of the watch has been truly outstanding. The overall rate appears to be slightly slow when kept partially wound on a winder (less than 1 second per day), but runs slightly fast when worn on my wrist (your mileage may vary, of course). The net result is that I have not had to reset this watch for well over a month, and it has stayed within 10 seconds of radio-controlled clock time (even during a ten day stretch on the winder). improve the overall performance, I cannot attribute the accuracy to one or the other. Regardless, the combination of the two appears to work well. 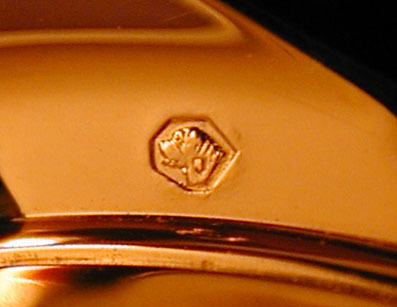 The crown is embossed with the Omega logo, and does not screw down. It is protected by two horns, and is of sufficient size and shape to allow comfortable manual winding and setting. The winding and setting itself has a standard ETA feel to it, nothing special. brown which complements the yellow gold perfectly. The deployant clasp is also 18k yellow gold and it differs from the usual clasp in having two pins to grasp holes in the strap. 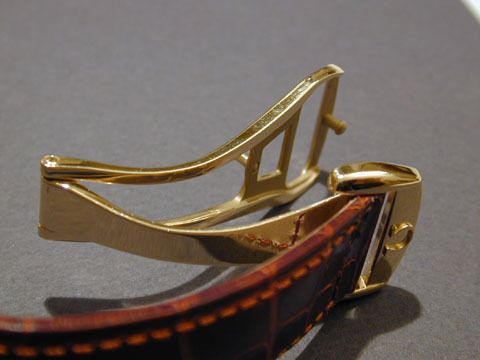 Note that the free end of the strap is folded under the buckle, rather than the usual through-the-buckle design. 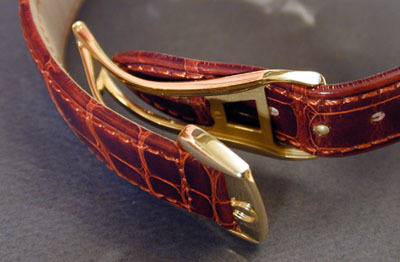 The clasp itself is very firm, with a good tactile feel to closing, and doesn’t show any tendency to open on its own. Well thought out, and well executed. 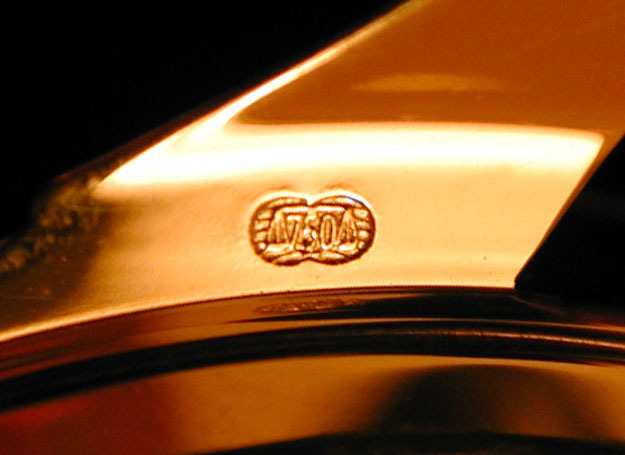 This close-up of the dial edge reveals two interesting design features. First, the printed minute markers are actually only half as long as they appear! 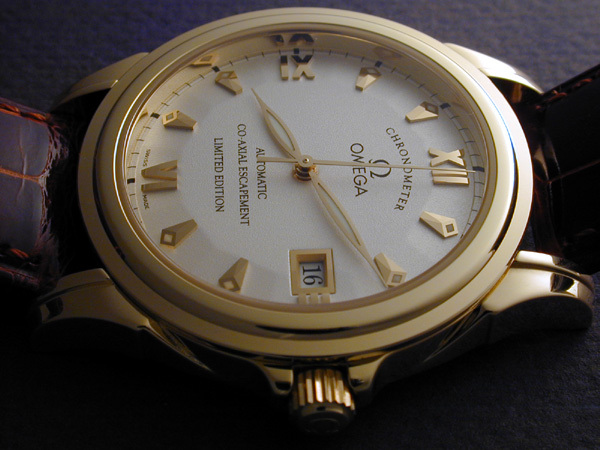 The appearance of the full length is given by the combination of the marker itself and its entire reflection in the inner case band surface (A). 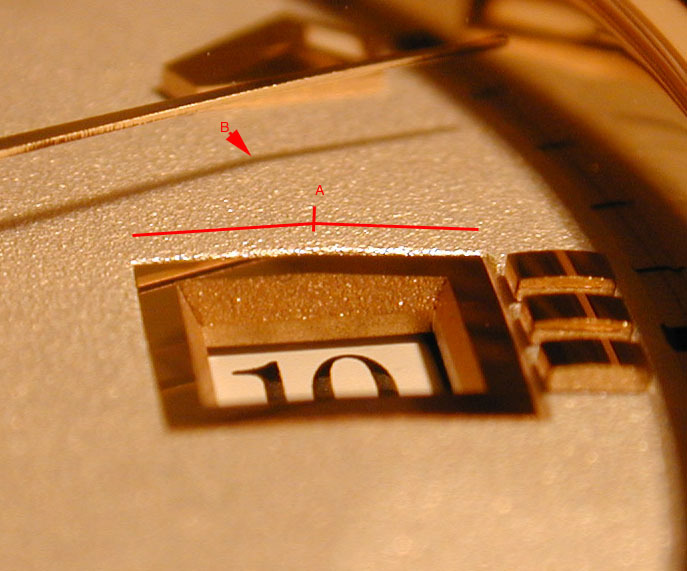 Second, there is a vertical step to the dial right at the edge before the minute markers (B). This gives an appearance of a finely printed circular track where none actually exists. (You can also see the non-tritium luminous diamond-shaped areas in the polyhedral hour markers in this photo). 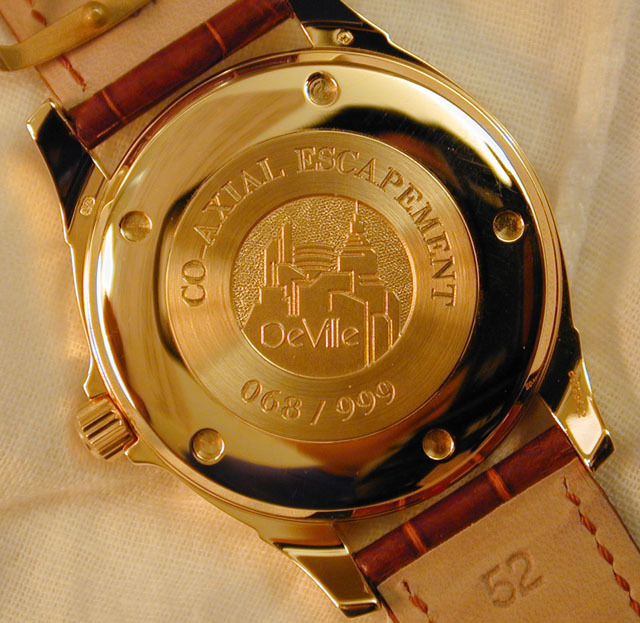 visible – that is, the Co-Axial movement hidden behind the solid back. 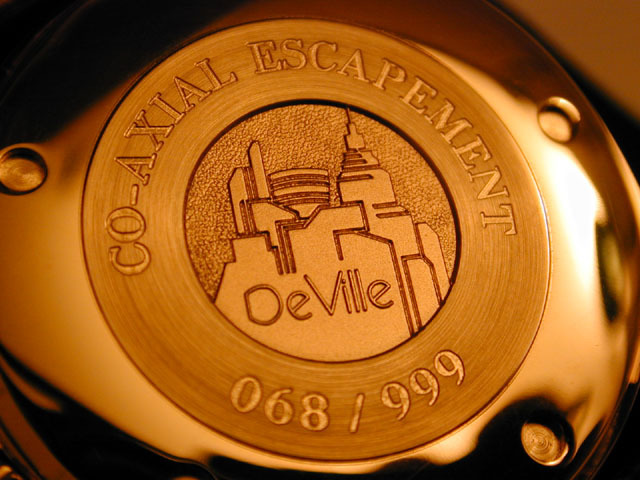 Some may argue that the Co-Axial escapement is wasted on an ETA 2892 based movement. I’ll disagree somewhat, only because the escapement is the single most important piece of any watch. Rather than develop an entirely new automatic winding system and wheel train, Omega took the conservative step in releasing it within a time tested and reliable architecture. 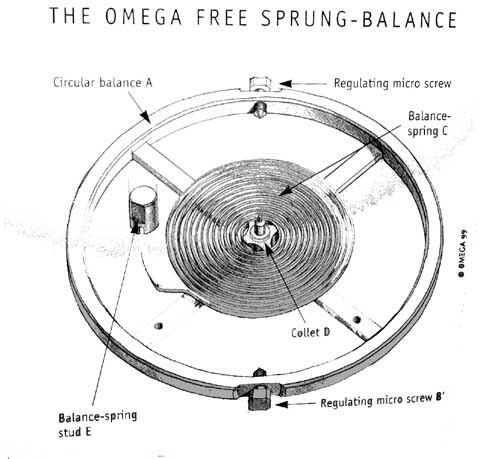 While purists may disagree, Omega chose to ensure that the world premier of the Co-Axial escapement would NOT be hindered by unrelated development problems elsewhere in the movement. This, to some extent, reduces the risk involved with introducing a radical (by horological standards) new technology. In any case, I’m very pleased with the watch. 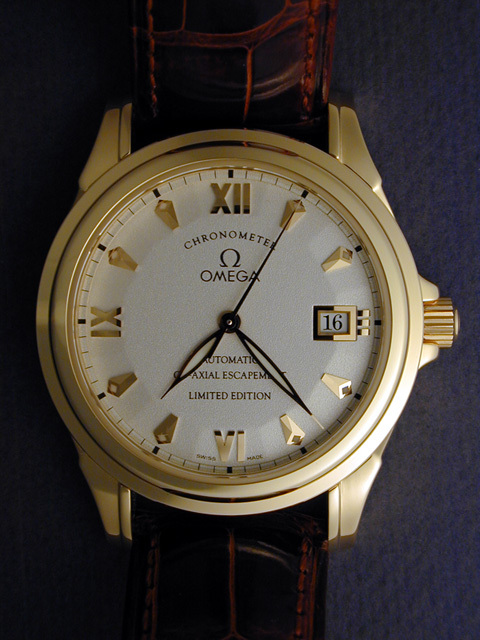 It has great styling of the dial and case, and is priced reasonably for a substantial gold watch even at full retail. The fact that it has the initial serial production run of a new escapement, and is also a limited edition is icing on the cake. About the photographs in this article: I used a Nikon Coolpix 950, with a tripod on a desktop. For many of the images, a light tent made of a white diffusion filter was placed over the watch, using a dark grey textured cardboard background. No flash was used; instead, a combination of direct and indirect halogen and regular incandescent lighting was used. Note that many of the photos have been resampled to half size using Adobe Photoshop 4.5.